Iseman Homes/Parkview Terrace has both new and pre-owned homes for sale that are ready for you to move in. 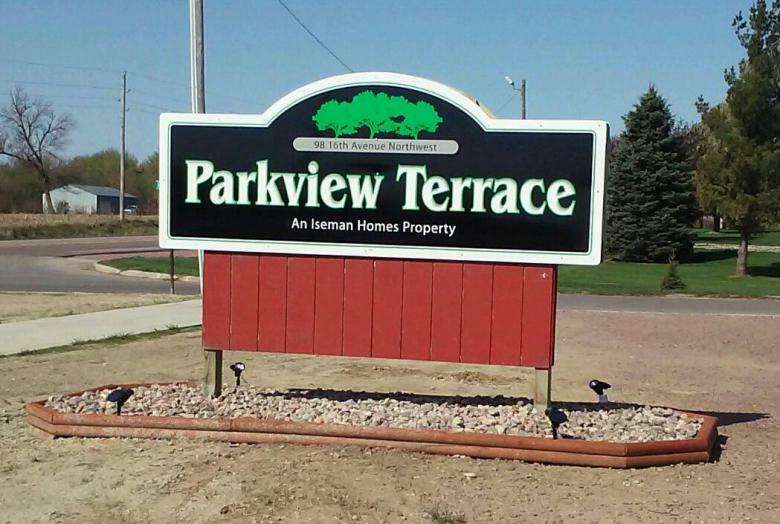 Parkview Terrace is a mobile home community located in a quiet country setting in Le Mars, Iowa. It is located just minutes from downtown, yet miles away from unwanted hustle and bustle. Parkview Terrace is a virtual oasis with spacious lots, handsomely landscaped with lush trees and vegetation. At Parkview Terrace there are no strangers, just friends we have not met. Lot rent starting at only $200.00 per month. Rental homes available. Call Nick at 712-546-8004 for Park Office or try the Sioux City Office at 712-252-0181 for Nick or Gary! Email nkrull@isemanhomes.com for more info! Parkview Terrace, 76 16th Ave. NW, Le Mars, IA "Ice Cream Capitol of the World"! If you are planning to buy a home, and you have been searching for an affordable Manufactured Home in LeMars, IA, Our LeMars, IA Manufactured/ Manufactured Homes would be a great solution for you. LeMars, IA manufactured homes are an affordable quality option. Our selection of Manufactured Homes in LeMars, IA, is second to none. Manufactured homes sold by Iseman Homes in LeMars, IA are the highest Quality in the area. Our LeMars, IA Modular Homes can be tailored to your specific choices. There are many advantages to living in the Manufactured homes sold by Iseman Homes LeMars, IA. These homes are spacious and accommodate any size family. Manufactured/Manufactured homes in LeMars, IA are now fast evolving as one of the most preferred types of housing. Manufactured homes can be custom made for your specifications in LeMars, IA, with existing homes also available for rent and for resale. LeMars, IA manufactured homes are very convenient for seasonal residence or perfect for retirement.